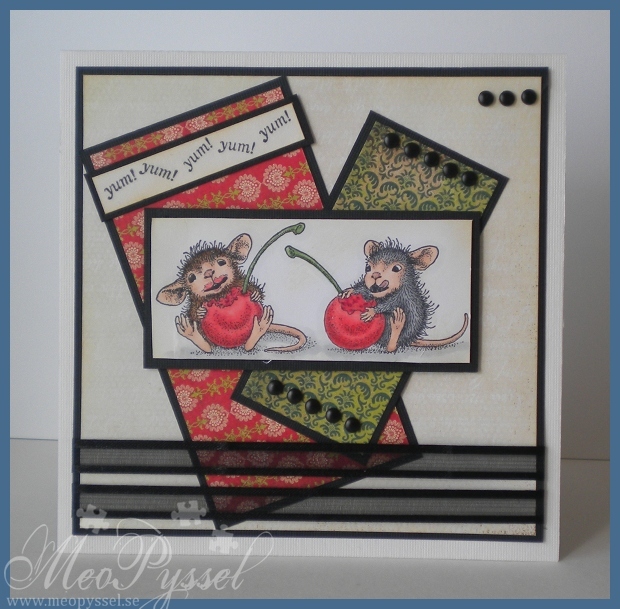 I have made another card for House Mouse and Friends 100ed challenge and this time i tried some new papers out. I used this week Sketch Saturday sketch for the layout. The Image is Fruity Fun from House Mouse and i colored it with only gray (N-series) and skin-tones (which i coated with Y21 to get a more yellow tone). The background have been distressed with Antique Linen so it won’t be any harsh white. I paper pierced around the edge for a bit more dimension. 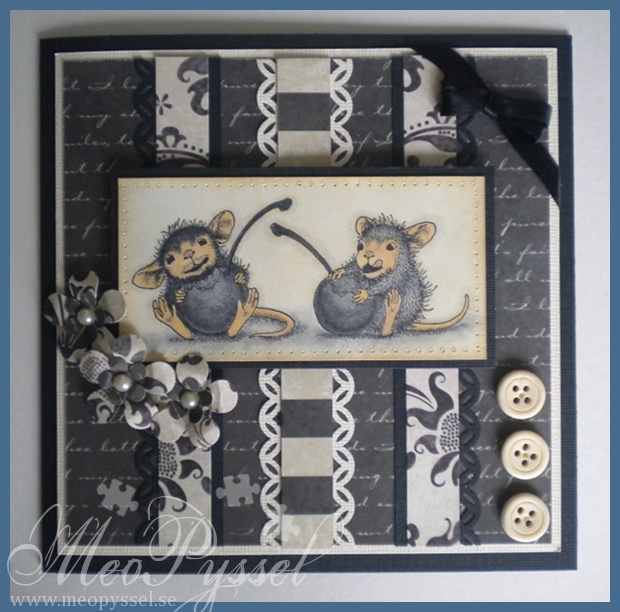 The Paper that is used is from Making Memories Paper Reverie collection. I love them, they are so delicate and soft and yet have a depth to them, As embellishments i used Martha Stewart’s borderpunch Modern Garland to mate the lacy borders. I used some beige buttons and a black satin ribbon. The flowers are made with Fiskar’s punch Retro flower (medium) and flower power. I put them together and put a pearl in the middle. 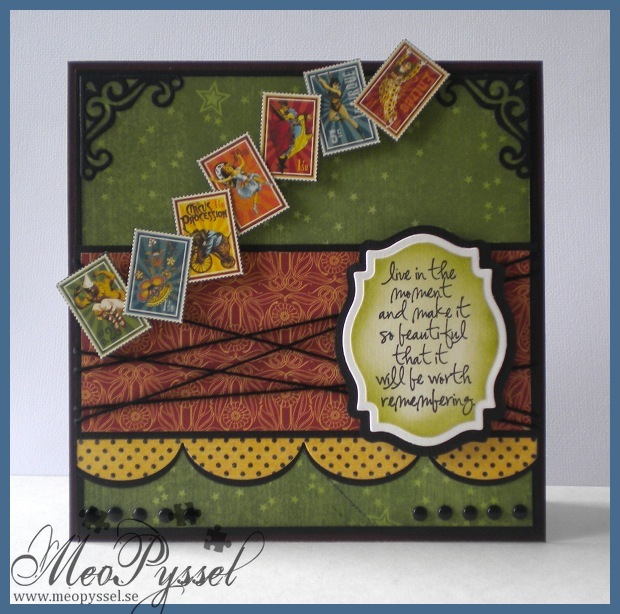 Punches: Martha Stwearts Modern Garland, Fiskars Retro Flower Medium and Flower Power. This card is for my friend that LOVES superman and batman, and he happens to have his birthday this weekend. The papers that i used is from DCWV’s All about Boys stack, that i actually bought just because these two sheets. Both papers had parts of glossy images, the superman is glossy on the yellow paper and the red words are glossy on the word-paper (and thats why it’s hard to get a good photo of it). I did follow this weeks Sketch Saturday layout and keept very true to it. 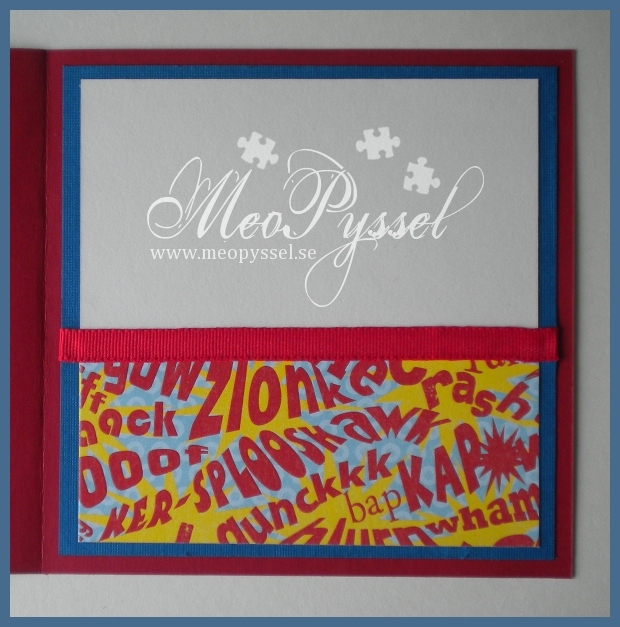 The tag on top is created with regular cardstock, Double Do’s alphabet die and Quickutz tag toppers die. The letters are yellow foam, but it was a bit to light to i colored the surface with Y08 to make it darker. I then punched out three holes with my Fiskars handpunch. 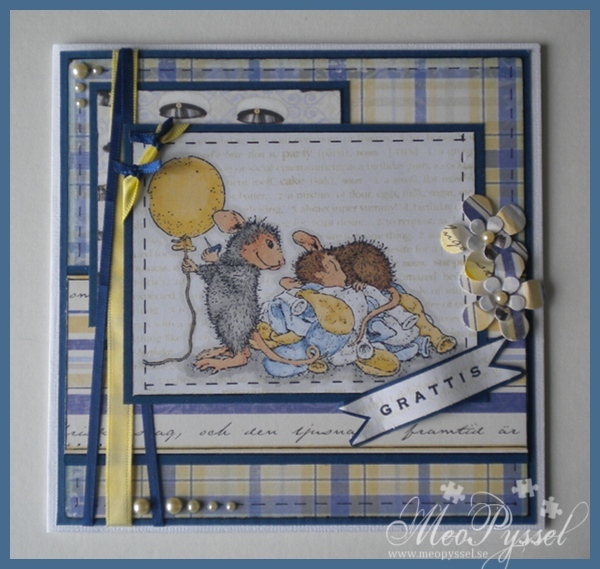 The word that is put at the tag is the Swedish word for congratulations.. 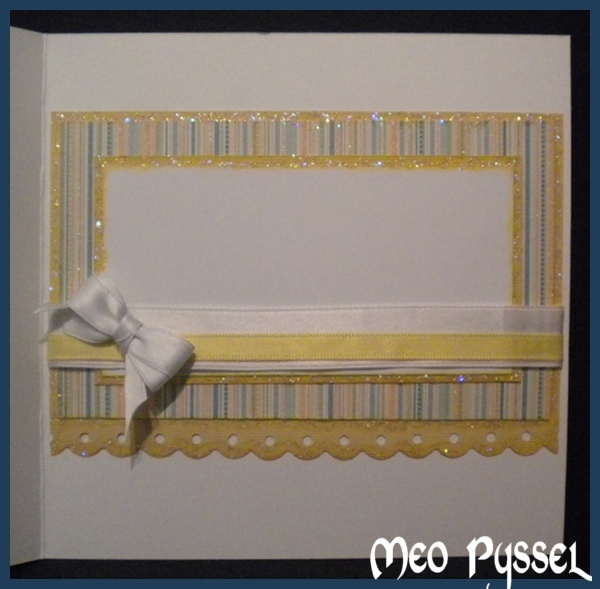 The embellishments on this cards is simple different kinds of ribbon and some minibrads. 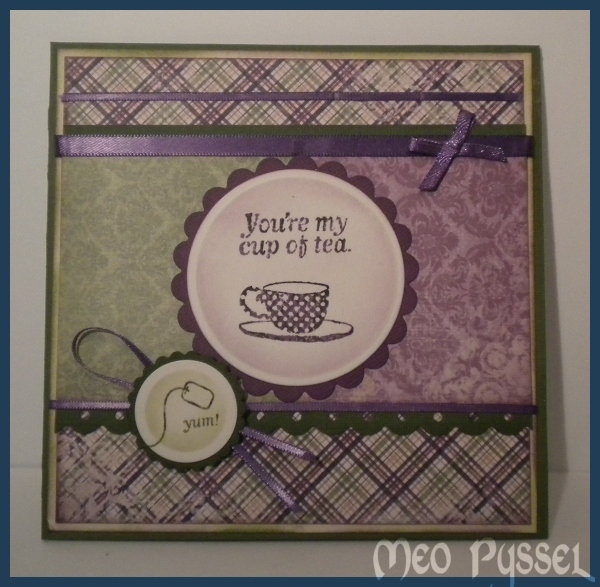 Todays card is made with an focal that I experimented with yesterday using emboss-resist-technique. 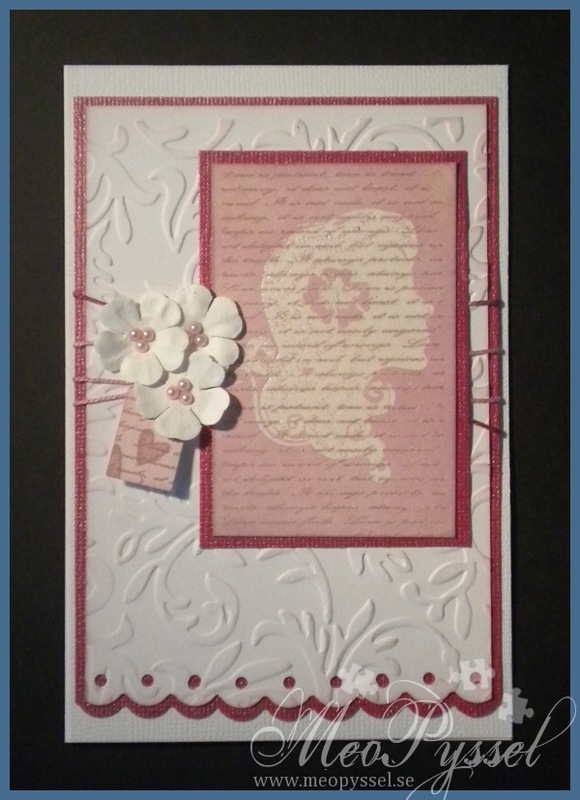 The focal image is first stamped with Gina K’s timeless textures, with Versa Colors 152 Ash Rose, the script stamp and then i clear-embossed Hero Arts Flower Lady. After that the entire imaged got heavily distressed with milled lavender. 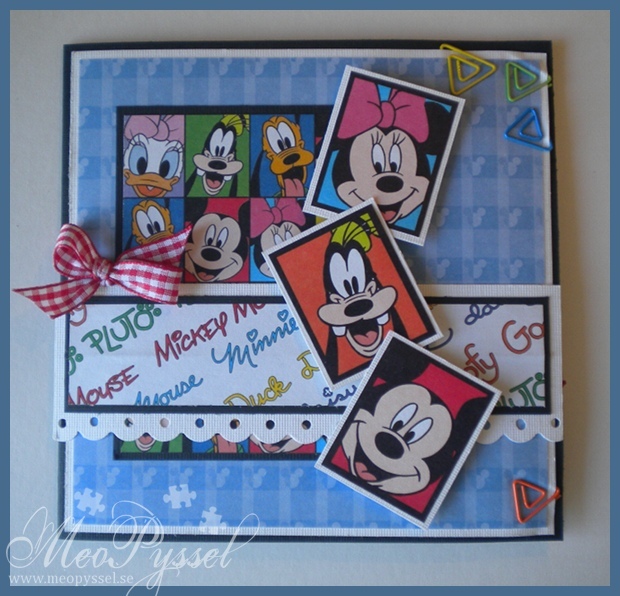 I did the same thing with the label, that is the Quickutz die labels, and i stamped two small hearts on it with the Ash Rose again. 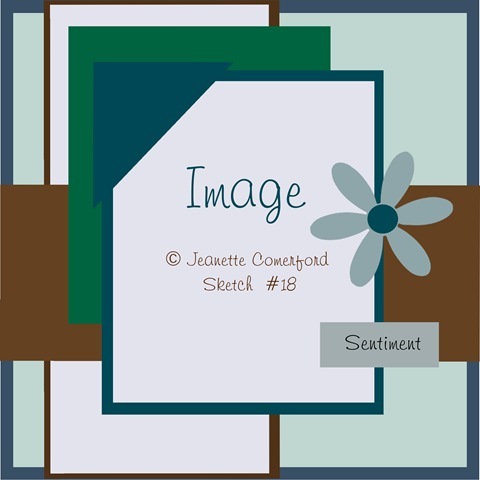 The cards background is a simple white cardstock that have been teated with provocrafts embossingfolder Victoria and then lightly distressed with some more milled lavender. 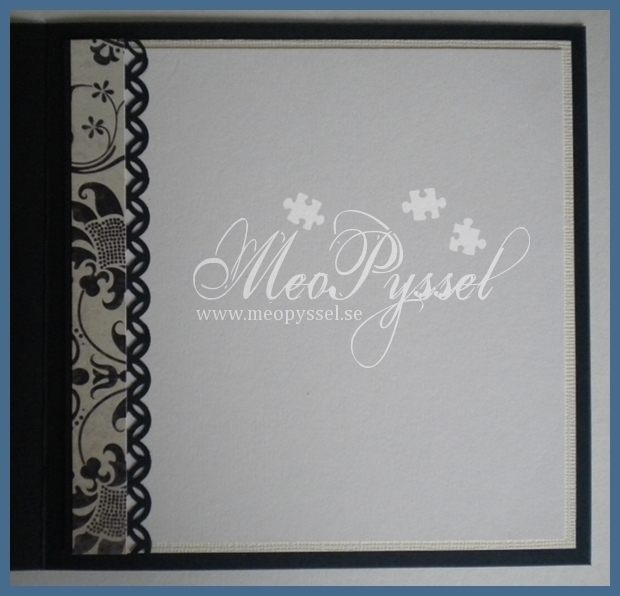 The bottom edge, bot white and pink paper, have been punched with Fiskar’s border punch scalloped circles. The flowers are simple white Reprint papers that has been embellished with some small pearls. The ribbon that is used is a pink multi-colored one that i think match both the dark and the light pink. The dark pink cardstock is a bazil bling one which makes it a bit hard to get a accurate picture of the color but it works really good together with the ash rose and milled lavender. 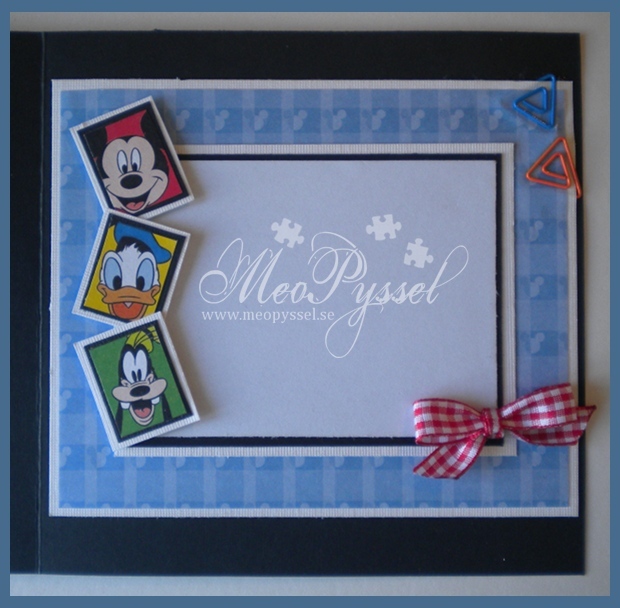 The card is a 15 x 10cm, very close to an A6. 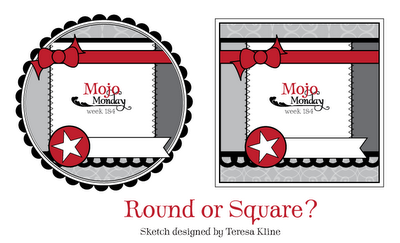 The cards layout is from this weeks Mojo Monday (#192). I didn’t change much but I’m happy. I’m also trying to enter this month Hero Arts challenge for the first time. I decied to do the same sketch as yesterday for today sence i wanted to do one more true to the sketch. All the papers are fron Inkidos collection Is this love?. 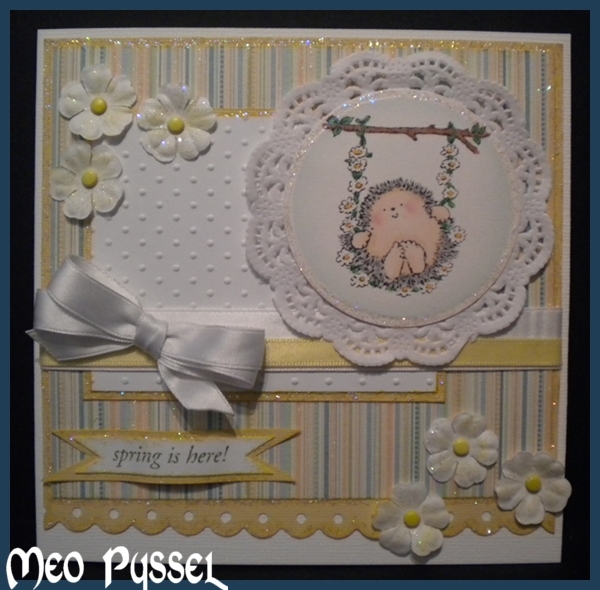 The white borders is Fiskars borderpunch scalloped lace and the circles in the middle is nestabilities dies that i then have punched with fiskars handpunch 1/162 and 1/8″. The stamp is a unknown one. Jag bestämde mig för att göra om veckan Mojo-layout och den här gången med ett kärlekstema eftersom jag hade en del papper från alla hjärtans dag som jag aldrig använde. Jag tycker om kortet, det är gulligt utan att vara allergiframkallande, tycker i alla fall jag. 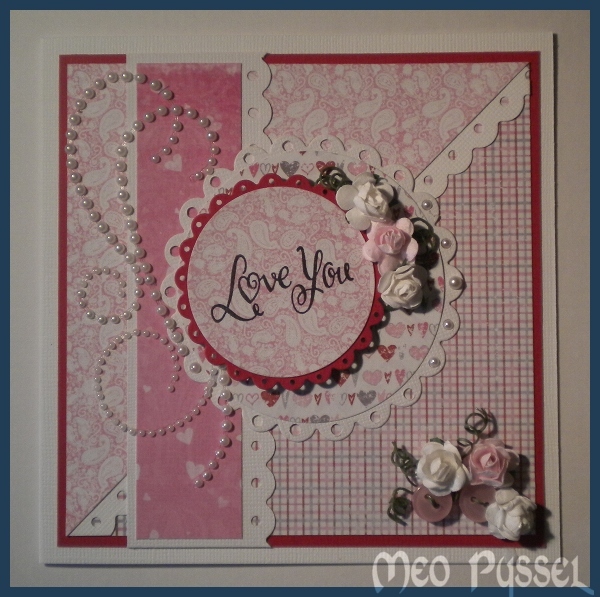 Papprena som jag har använt är från Inkidos kollektion Is This Love, och jag tycker om den mjuka framtoningen även om det var svårt att hitta matchande cardstock i mitt förråd. Jag har använd Fiskars Border punch Scalloped Lace och motivets cirklar är gjort med nestabilitie soch fiskars handpunch i både 1/16″ och 1/8″. Stämpeln är av okänt märke som jag fått efter en av min mammas turer till den stora kontinenten i väst. Nu ska jag förhoppningsvis skapa ett kort till Jimmy som fyller år imorgon. 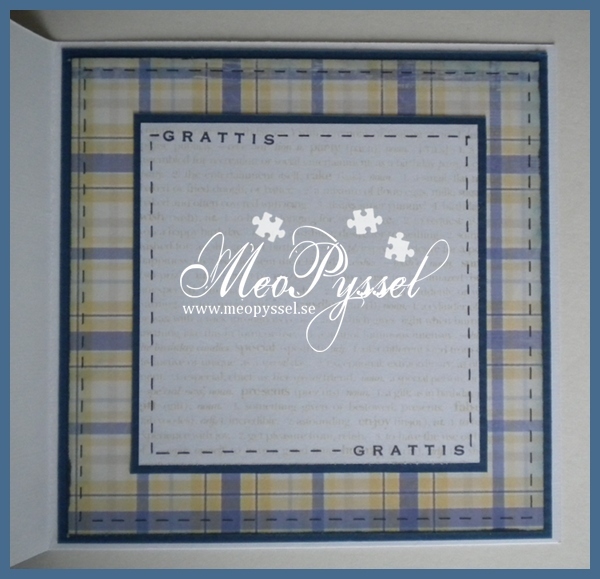 The papers that are used are from Pion Design and the kollection is called Sagan om våren (in translation “the tale of spring”). The motive are framed by nestabilities scalloped circle and then i have punched out the holes with my fiskars handpunch 1/16″. 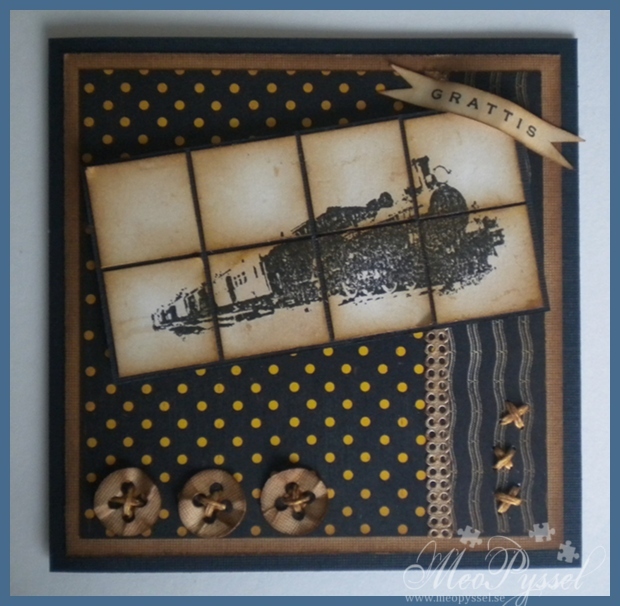 The lacy border is also a fiskars punch, a border punch, and i did use the leftovers after the punching to the steam or branches that is instead of the blocks in the sketch. I also switched the embalishments under the motive to text that is made from Quickkutz alphabet harvest. (Vår=Spring). 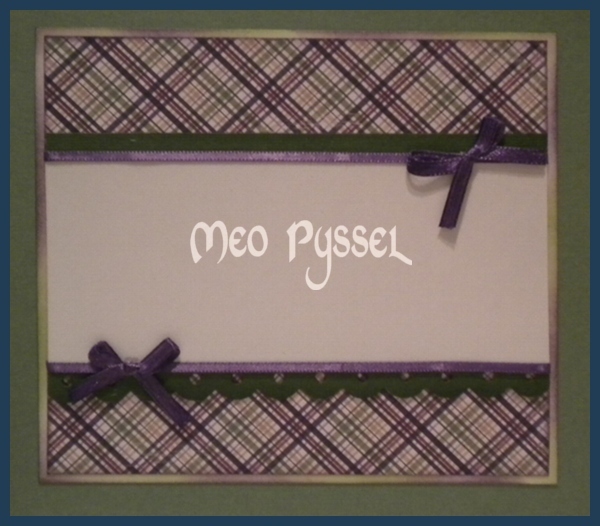 The green paper that is added in the corner is embossed with Cuttlebugs embossingfolder Victoria. 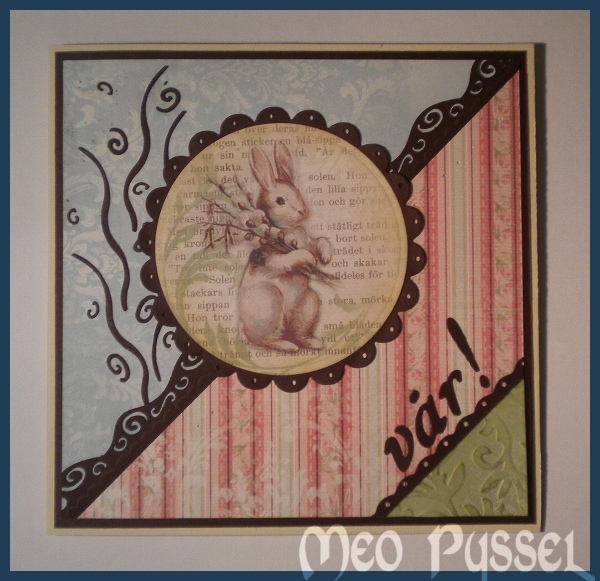 Around the edge of the bunny i have also distressed with Antique Linnen. 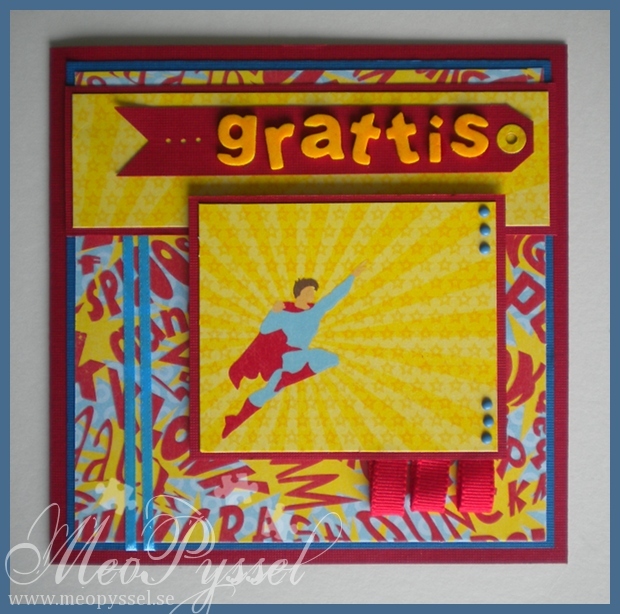 I dag har jag lekt lite med Mojo mondays veckoskretch och mina nya papper (jag var ju tvungen att fira mina pappersställ) från Pion Design. Jag har valt att göra ett vårkort till min farmor och farfar. Jag har tagit bort de vertikala blocken från ritningen eftersom att jag inte kunde hitta något snyggt sätt att få in dem. Jag bytte istället ut blocken mot ett mönster av brun cardstock. De små bitarna är resterna från när jag gjorde spetskanten som löper diagonalt. 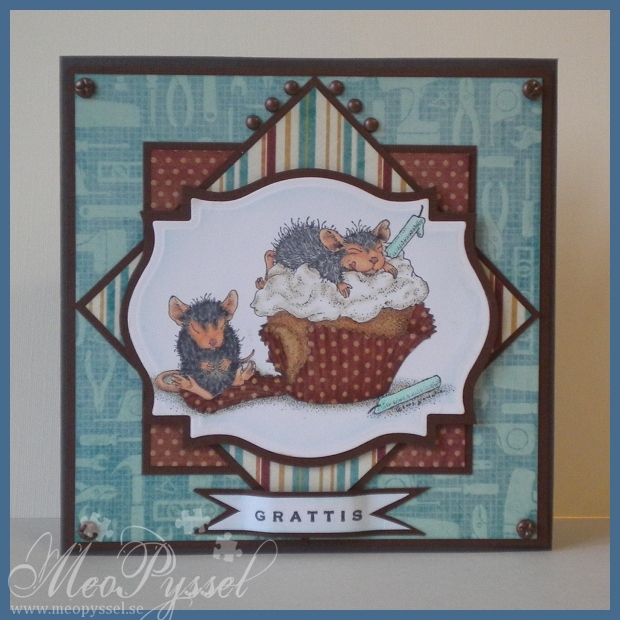 Kanten är gjord med en Fiskars Border Punch. Ramen runt motivet är en scalloped nestabilities som jag har stansat ut cirklar från med Fiskars handpunch 1/16″. På samma sätt har jag gjort med den lilla kanten på den gröna delen. Jag har skurit pappret med en mönstersax och sedan stansat ut cirklarna. Den gröna pappret är också embossat med Cuttlebugs Victoria embossingfolder. Alfabetet som jag använt är Quickutz Harvest. Runt kanten på motivet har jag distressat lite med Antique Linnen. Alla papper som är använda och motivet, som är ett papper, kommer från kollektionen Sagan om våren av Pion Design. Jag tycker verkligen om den här kollektionen, det är så vårig, ljus och spröd.